Sweet mother of confection! We are bouncing off the walls over this perfect combination: our exquisite Black Forrest Cake Coffee and these Chocolate Cherry Cupcakes from BakedByAnIntrovert.com. Could you think of a more dynamic duo? First, you’ll want to preheat your oven to 350°F. Now prepare your muffin pan 20 paper liners. In a large mixing bowl, stir together the sugar, butter, and oil until fully incorporated. Add in your eggs and beat until your mixture is well blended. Now add in your vanilla. In a separate bowl, whisk together the flour, baking soda, baking powder, cocoa powder, and salt. Slowly add your mixture to the butter mix. Whisk in milk and beat until fully blended. Add 2 tablespoons of batter to each prepared cupcake liner, and bake for 15-20 minutes. Then place your cupcakes on a rack to cool. 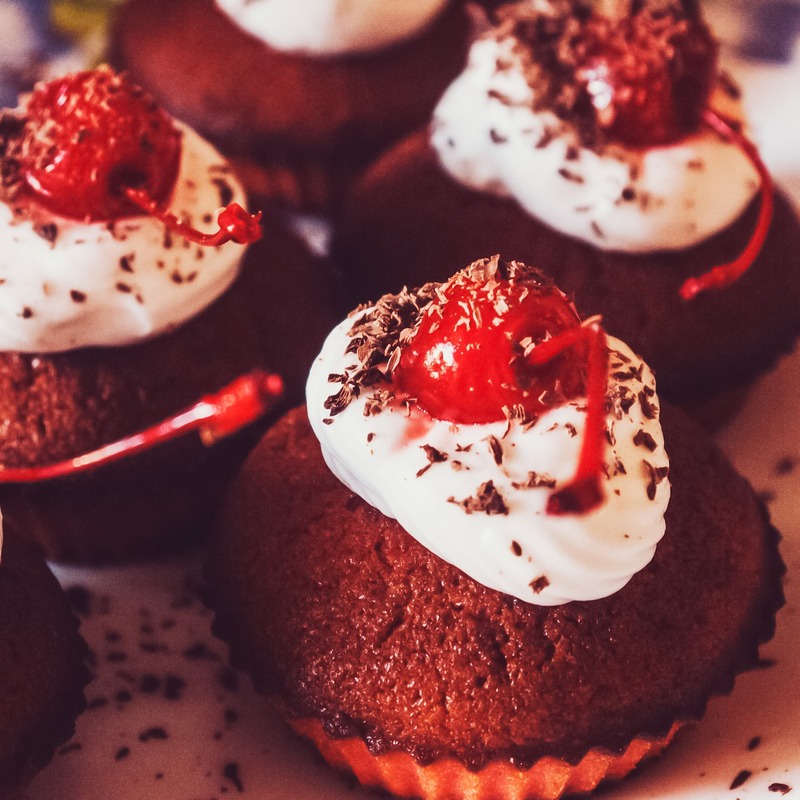 Using a knife or spoon, Create a depression in each cupcake by gently cutting away the top layer. Fill the hole with cherry preserves and replace the cupcake top. Add a dollop or two of frosting and garnish with fresh cherries. For your frosting, you’ll want to beat the butter until thick. Gradually beat your powdered sugar, and add in cream until frosting is thick and spreadable. Add in the cherry preserves and slowly beat. If the frosting is too thin, gradually add more powdered sugar. Are you bouncing off the walls like us? Is your dessert a confection perfection? We want to see! Share a photo on our Facebook page, or comment below and tell us how you like the cherry-on-cherry combination. Black Forrest Cake Coffee and Chocolate Cherry Cupcakes for the win!